Many people ask us how to put together a cheese platter with accompaniments for a party they are having. Keep it simple! You can also call our office and they will assist in your cheese selection. We will also mature cheeses for you here at the farm so just talk to us about what you are looking to do. Choose different styles of cheese to serve. This may seem obvious, but it's the most important part of putting a selection of cheeses together for a group. The variety should give your guests different textures, colors and flavours to enjoy. For example a good mix would be Brown’s cream cheese or Mariotta. Follow this with gouda, provolone and cheddar. Then include one or both of our blue cheese selection. 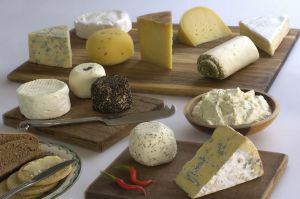 If you only enjoy hard cheese then you can do a plate with just 4 or 5 of our hard cheeses. If you like soft cheeses then a good mix would be the plain cream cheese followed by the garlic and herb roulé, pili pili and then Brown’s Brie. Serve an odd number of cheeses as this is more visually pleasing. Try to limit yourself to 3,5 or 7 cheeses. Serve one or two bread-like things to eat the cheese alongside. Keep it simple, like plain, crackers or plain baguette. Fruit and nut breads can also be nice with blue cheeses. One accompaniment should be sweet-- like honey, dried fruit, or chutney and the other savory-- like olives, spiced nuts, or cured meat. To determine how much cheese to buy think about whether the cheese is the main meal or simply a part of it. If you're having cheese before a meal, you may want to serve a bit more, while if you're serving it afterwards, for dessert or as a course before dessert, you might need a little less. A general rule of thumb is to buy 3/4 to 1 ounce of each cheese per person. So if you're having 4 people over, you'd probably buy about 4 ounces (or 1/4 lb.) of each cheese you serve.